Last night, Blizzard started the beta test for the Necromancer in Diablo 3. In this Beta phase, players can take a picture of the class and the individual abilities and find out how the Necro is in the different situations. In addition, the developers released a preview of what is expected in Patch 2.6.0. These include new challenge portals, which change regularly. The time has come and the beta test for the Necromancer has started but only for players who have received an invitation for this test phase. Keep an eye on your e-mail mailboxes. All others must wait for the release of the Necromancer in Patch 2.6.0, which does not yet have an official release date. The Necromancer is considered a master of the dark arts and commands the powers of life and death to restore the balance. The Necromancers are powerful wizards who destroy their enemies with curses as well as with resurrected servants. In addition, a versatile army of undead is also available to the Necromancers. 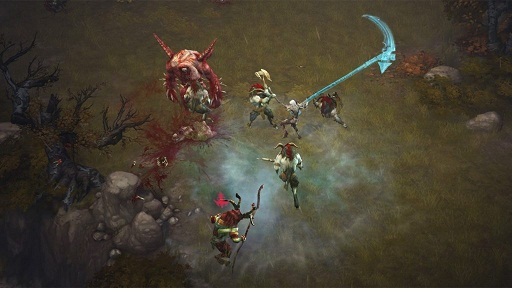 Blood and bones are the most important building blocks in the game of the new class in Diablo 3. - You can try new builds from other players in a dungeon that changes every week. You can start the challenge portals, similar to the adventure and story mode, in the main screen of the game. - During the beta, new challenge portals may be available more frequently for test purposes. - The Moors, a new area in Diablo 3. You can reach them, like the dark temple of the firstborn, via a new waypoint in the second act and explore them in adventure mode. - The user interface of the set dungeon portal has been updated to make it clearer and understandable the requirements for completing the levels. - Thus the criteria of the basic level must be completed within the time. - Four new waypoints await you in Act IV. Each of them offers you a new head money, which you can work off. "These fatal spheres are the unforeseen consequences of the struggle between Nephalem and Diablo in the Heavens."